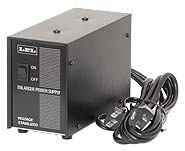 Replacement 120V voltage stabilized power supply for LPL model 7451, 7452, and 7452L 4"x5" enlargers. For use with 200W and 250W 82V lamps as specified for those enlargers. Supplied with instruction sheet. NOTE: This power supply has a round 4-pin connector compatible with the round plug on the lamphouse cord supplied with current LPL and Omega/LPL enlargers. This connector is not compatible with the square plug on the lamphouse power cord as found on earlier Saunders/LPL enlargers. Nor is it compatible with the 3-pin round plug on the lamphouse power cord on LPL enlargers supplied in 220V-240V markets. For power supplies for square plug Saunders/LPL enlargers, and 220V power supplies, please see the separate listings.